We’ve teamed up with BetVictor to preview the day’s racing. As well as the feature Coral Eclipse Stakes this weekend from Sandown – big race brought forward to 2.10 because of England’s quarter final with Sweden – there is a cracking card from Haydock with Roger Charlton looking to follow up last weekend’s Northumberland Plate success with victory in the Old Newton Cup courtesy of Atty Perse who is BetVictor’s 11/2 market leader. The four-year-old has been gelded since winning at disappointing on soft ground at York back in August but is sure to be cherry ripe for his belated reappearance and his second to Laraaib – giving him 8lbs - over Saturday’s C&D last May is top class form which he went on to better when winning at Royal Ascot. Jamie Spencer is likely to take the mount with James Doyle required for Hawkbill at Sandown. They race at Haydock today and I am keen on the chances of Space Talk (2.00) in the opener for Harry Dunlop and Nicola Currie who has been in the saddle for two of the three-year-olds three career starts to date. The filly had a poor draw when second to the useful Pride’s Gold at Wolverhampton on her last start and she begins her life in handicaps from what I feel is a workable mark. The step back up to a mile should suit and I would be disappointed if she doesn’t go close in a competitive fillies’ handicap. Jonah Jones (2.30) was given a lovely introduction when third to Hesslewood at York on debut and I think Tom Dascombe’s colt can reverse the form on 6lbs better terms for a length-and-half. The selection may have most to fear from the Kevin Ryan newcomer Swinging Eddie and a check of the market is advised for this half-brother to several winners. After England’s defeat of Colombia on Tuesday Pablo Escobarr (3.30) would be a topical winner. The selection was just edged out on debut and the winner (Certain Lad) was beaten less than two lengths in a Group 2 at the Curragh last weekend. Mark Johnston’s juvenile looked a real galloper on debut and I will be surprised if champion jockey Silvestre De Sousa does not make plenty of use of his mount from stall two. 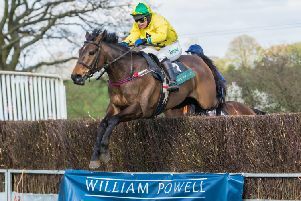 Border Breaker (3.10) has been raised 13lbs for winning at Cartmel on only his second start for Sam England but he has won from a mark 7lbs higher over today’s C&D at Perth albeit three years ago. Irish raider I’m An Izz Whizz is only 3lbs higher than when winning at Market Rasen on his last start and has run well fresh in the past. He is a big danger to the selection. I would put a line through the form of Kilbree Kid’s latest sixth at Stratford in their Champion Hunter Chase as the race was run on ground softer than ideal – over-watered. He must go close, but Cooking Fat (4.10) is entitled to come on for his first start for Pauline Robson over an inadequate two-and-a-half-miles here last month and the combination of first-time blinkers and a 2lbs lower mark can help give the seven-year-old his first win over the larger obstacles. Note today’s jockey Brian Hughes has been in the saddle for two of his three career wins over timber. At Newbury, Almurr (6.45) was just run out of it close home when runner up here last month over a slightly longer trip than he encounters (6f) this evening. He can go one better for Brian Meehan with William Buick taking over in the saddle. The 12f Handicap is a belter despite just five going to post and Sleeping Lion must have every chance if he can transfer the form of his fluent Kempton win to turf. King Lud is weighted to beat Cacophonous (7.15) on their recent Salisbury meeting but I just feel the latter is open to considerable improvement and expect Fran Berry to make more use of the colt than was the case last time. There is a wonderful Grade 3 Hurdle at beautiful Tipperary this evening and my two against the field are The Game Changer and Tigris River (8.00) with marginal preference for Irish Derby winning trainer Joseph O’Brien’s charge who won the Galway Hurdle last year. For all your racing needs check out BetVictor.com or follow us on Twitter.